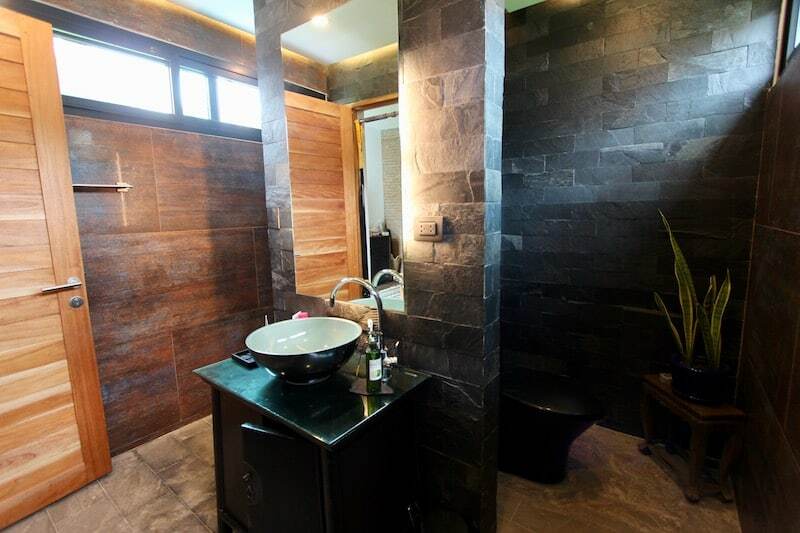 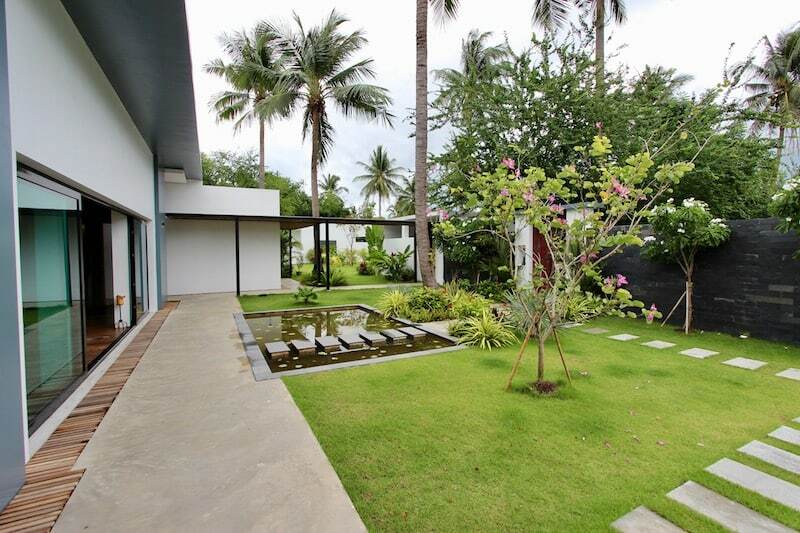 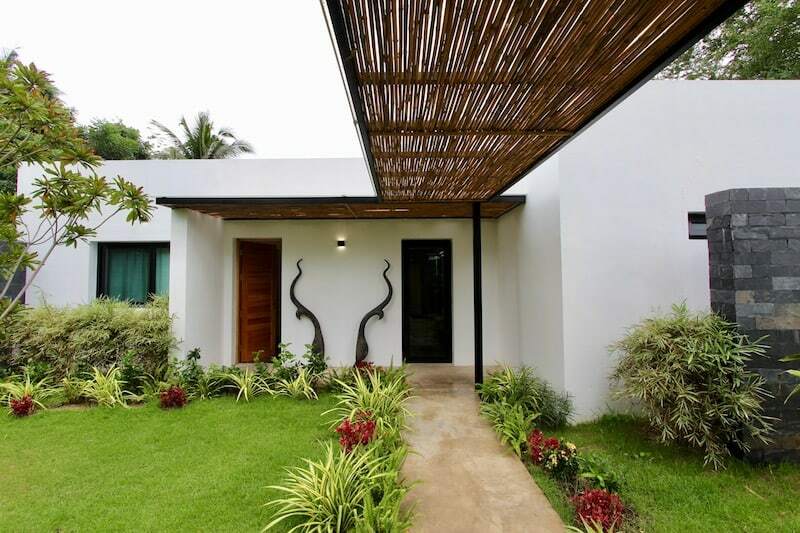 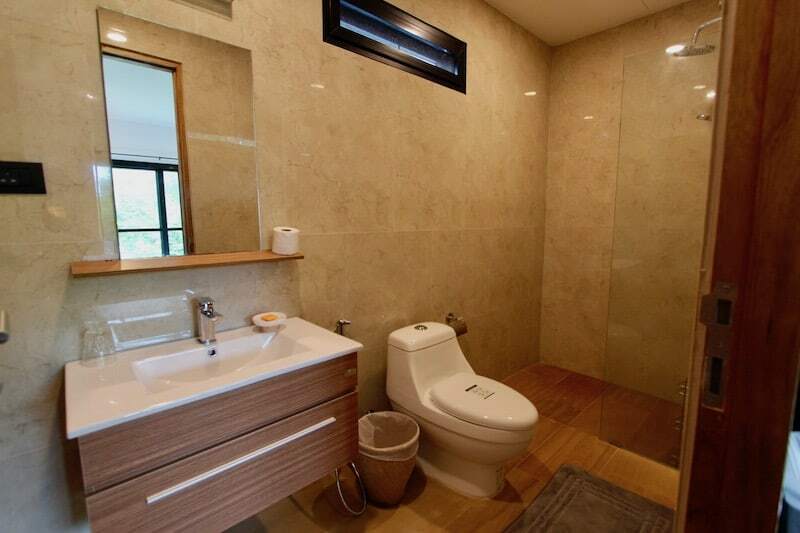 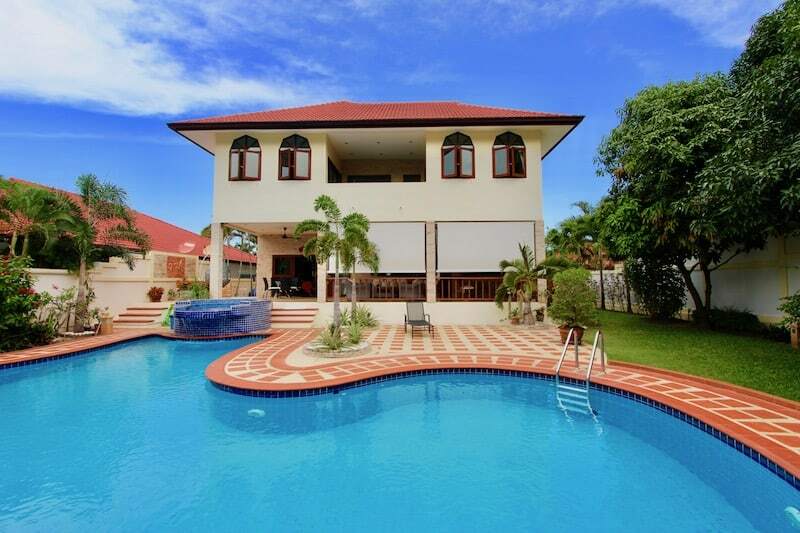 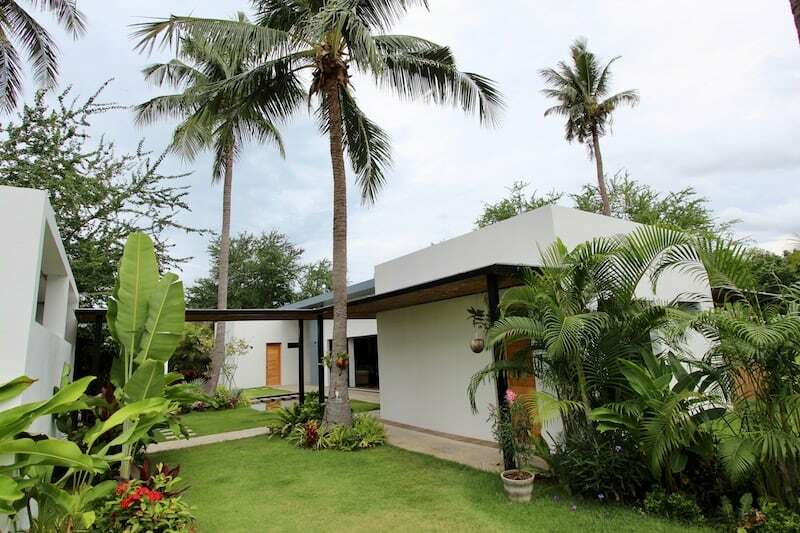 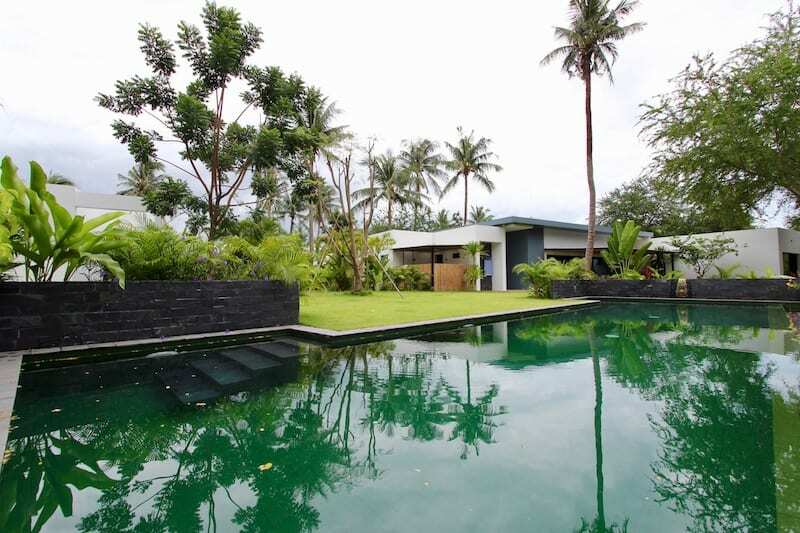 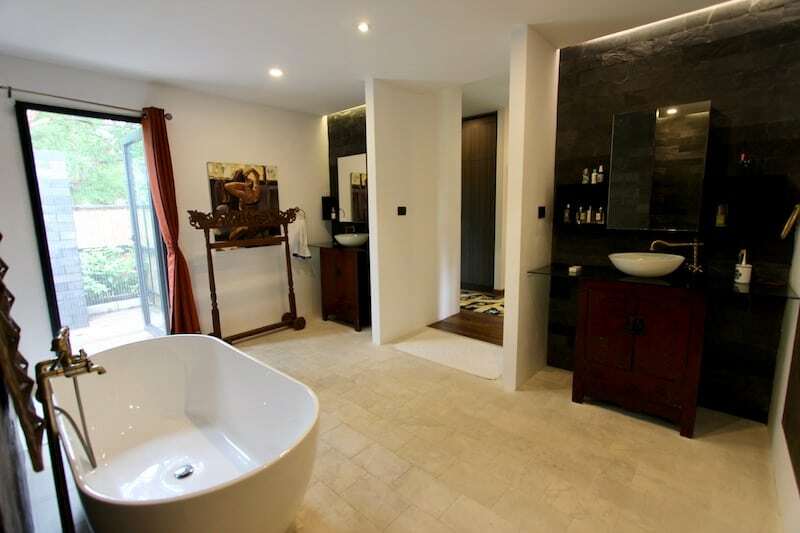 This is an impressive Hua Hin villa for sale near Palm Hills, includes a sprawling complex located on 2+ rai of land (3,200 m2) within a small, private development just next to Palm Hills golf course. 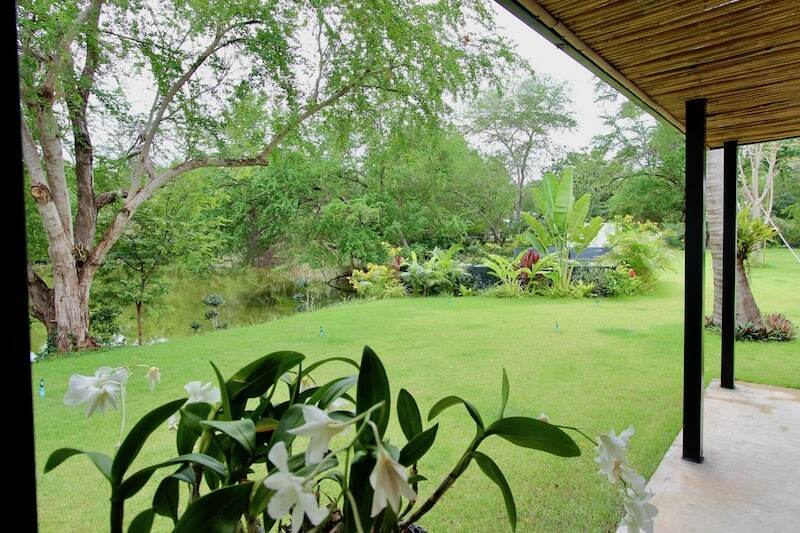 The property is bordered on two sides by two large lakes, which provide extra privacy and beautiful views from every vantage point. 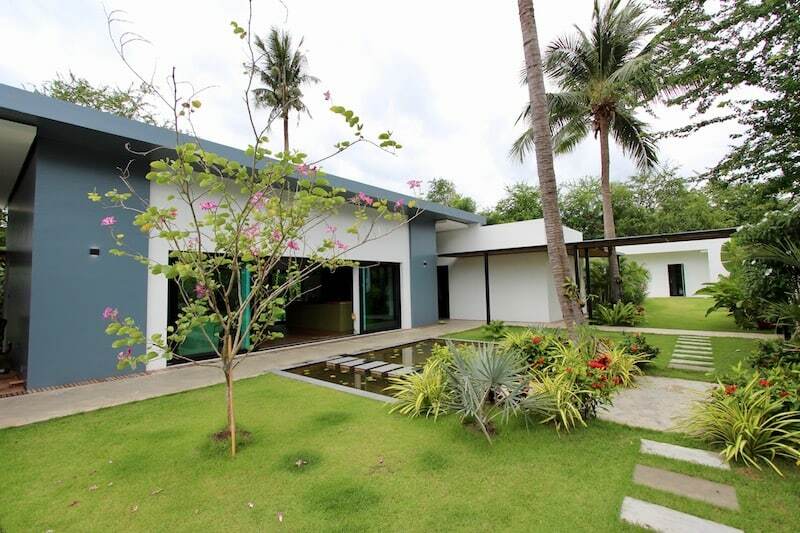 The home has a total of 7 bedrooms, 7 bathrooms + guest toilet, and 350 m2 of living area, which is spread out over 3 separate wings. 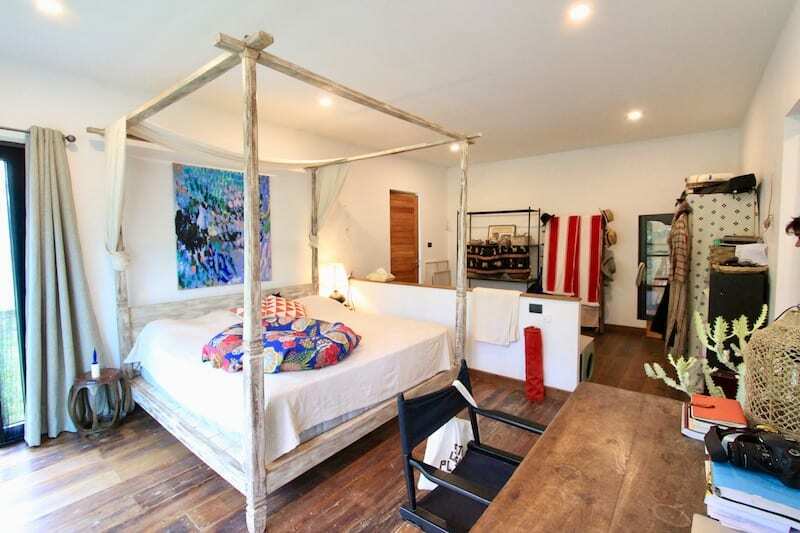 The main house has the master suite and 2 guest bedrooms; and there are 2 additional, separate guest suites with 2 bedrooms, 2 bathrooms and a living room each. 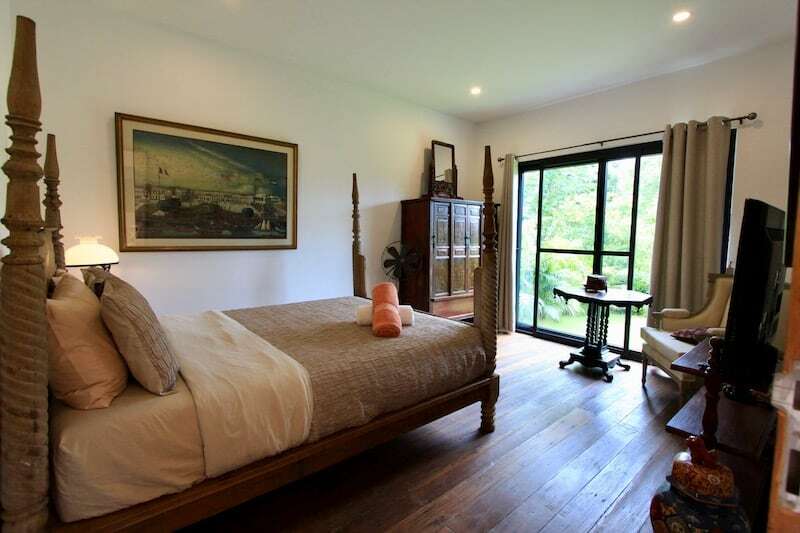 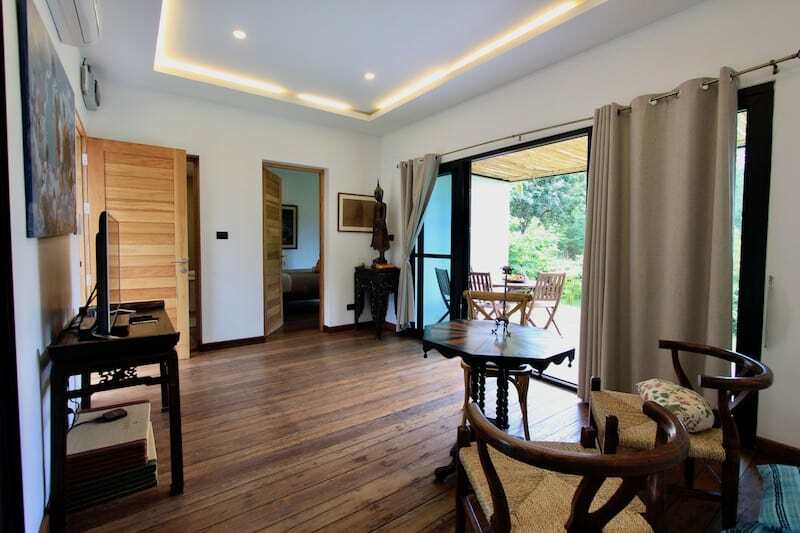 The layout of the property is ideal for large families or for hosting a lot of guests or a retreat. 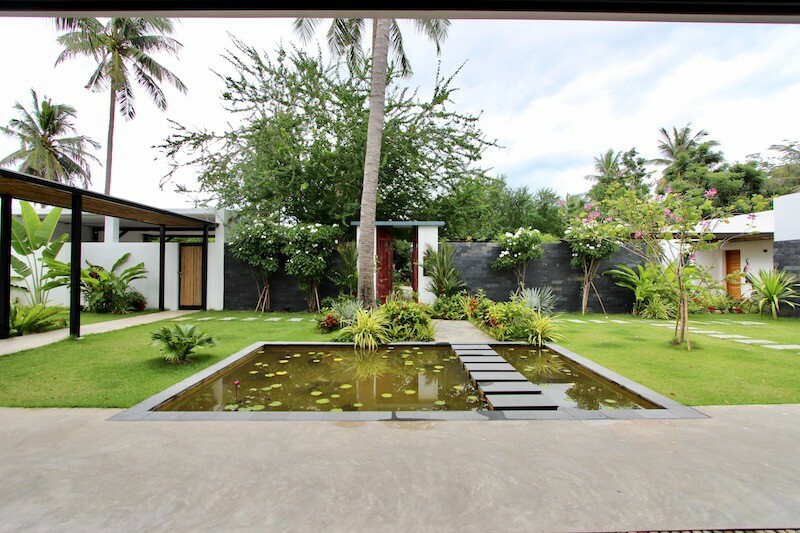 In fact, the home would be ideal as a yoga, meditation or wellness retreat, thanks to its spaciousness, privacy and tranquil natural surroundings. 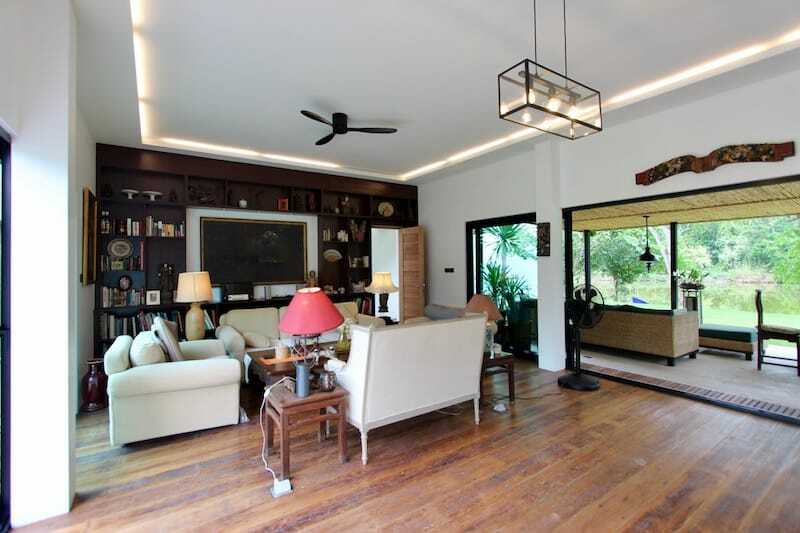 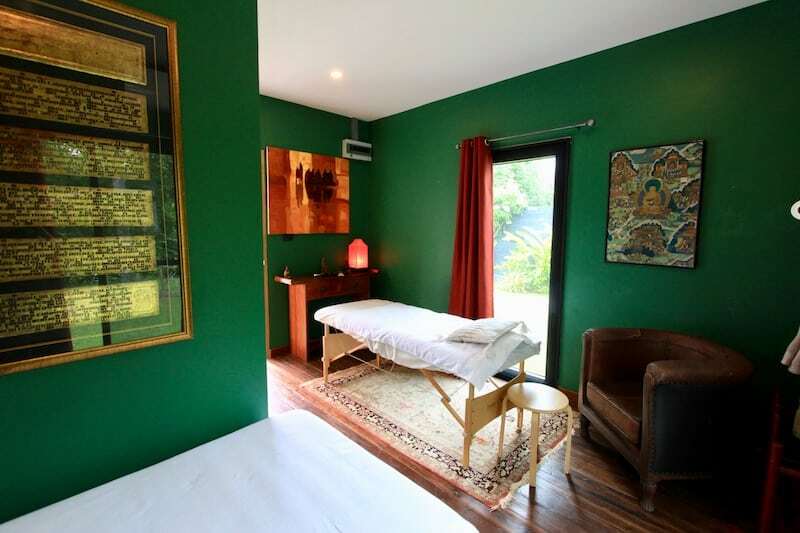 The main house has a large, open plan living room and kitchen with recessed lighting and gorgeous hardwood floors (reclaimed Teak from old Thai houses). 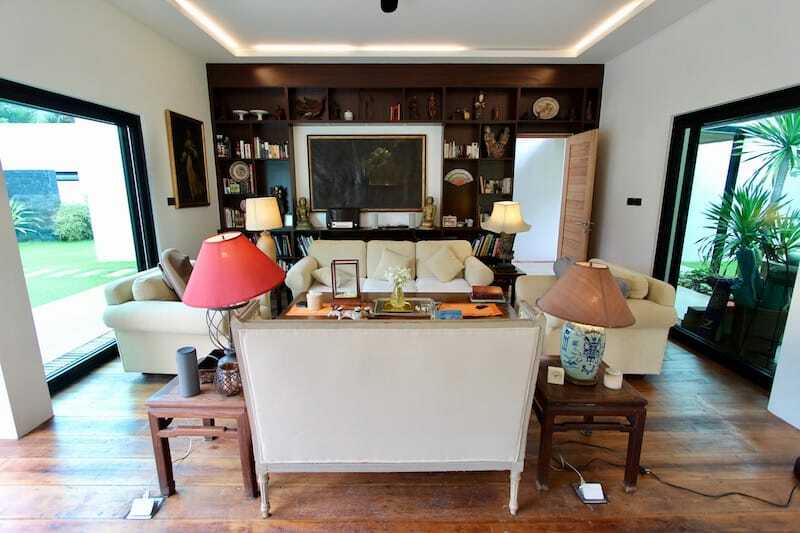 The living room has a lovely custom-designed built-in to showcase beautiful artwork and collectibles. 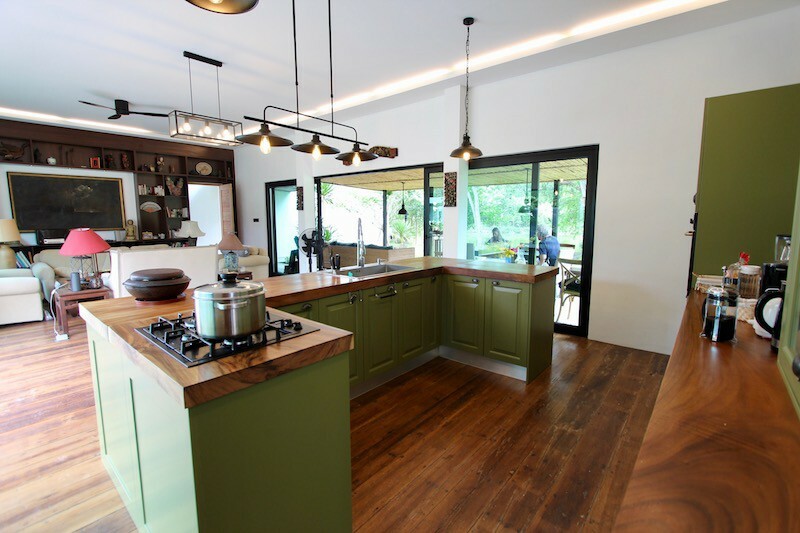 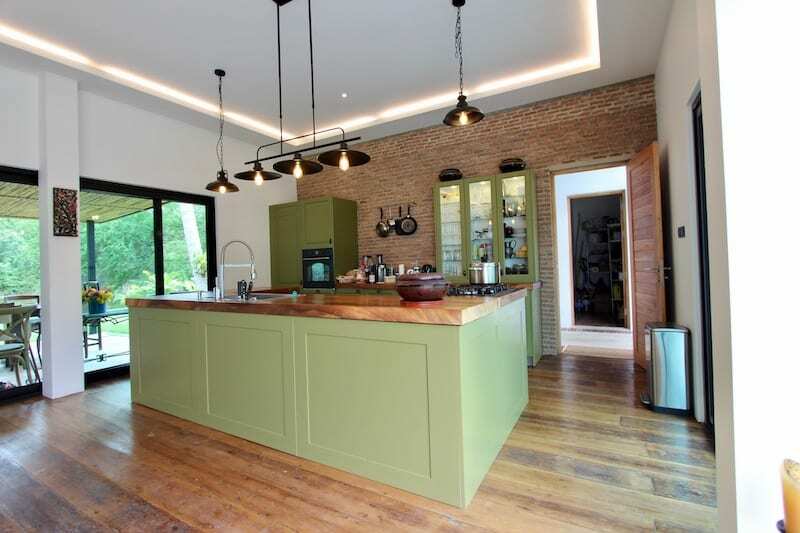 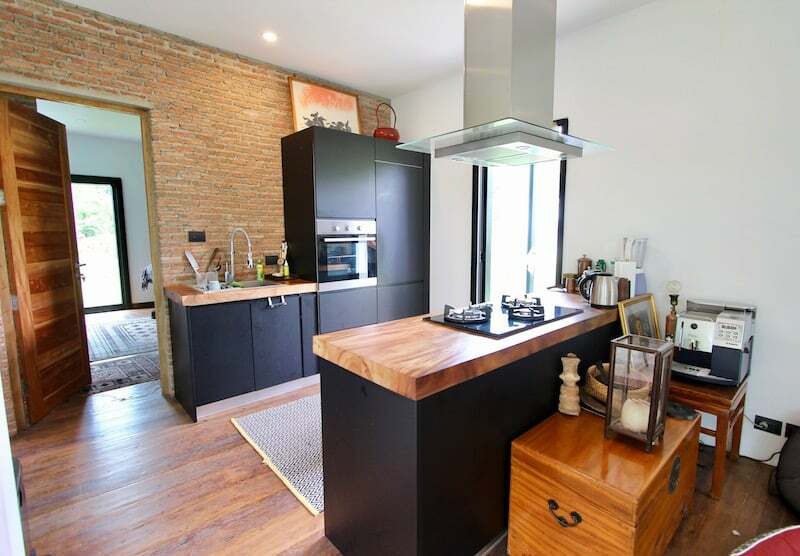 The kitchen is a charming retro green with salvaged Teak countertops that add warmth and luxury to the home. 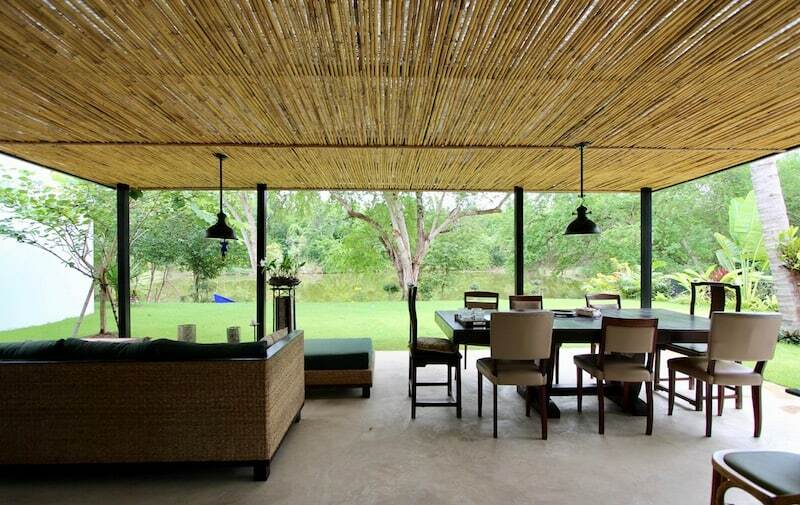 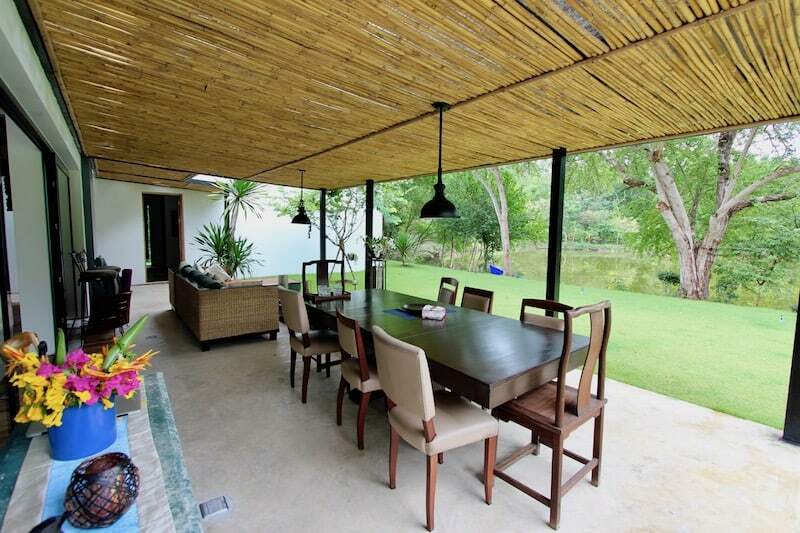 There is a covered outdoor terrace off the living area with a dining table and a lounge set overlooking the large lake and the manicured tropical garden. 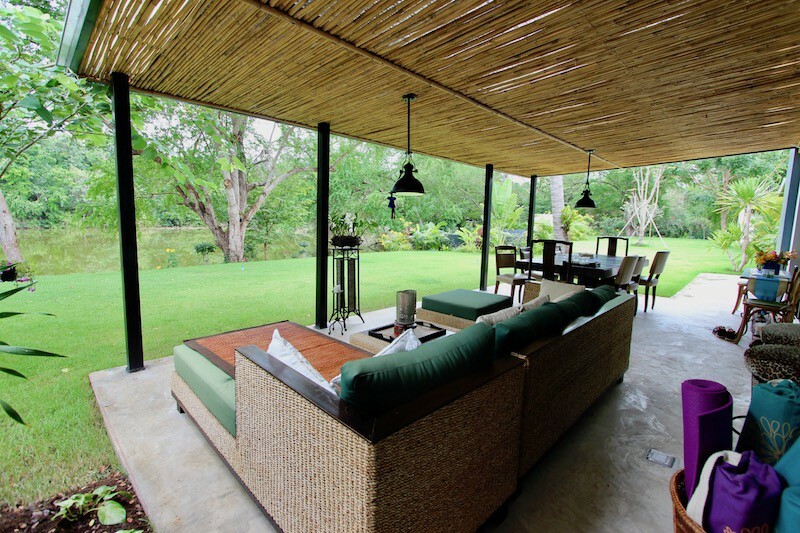 This is the perfect spot to enjoy a coffee in the morning or a glass of wine in the evening, perfectly peaceful and private at any time of day and. 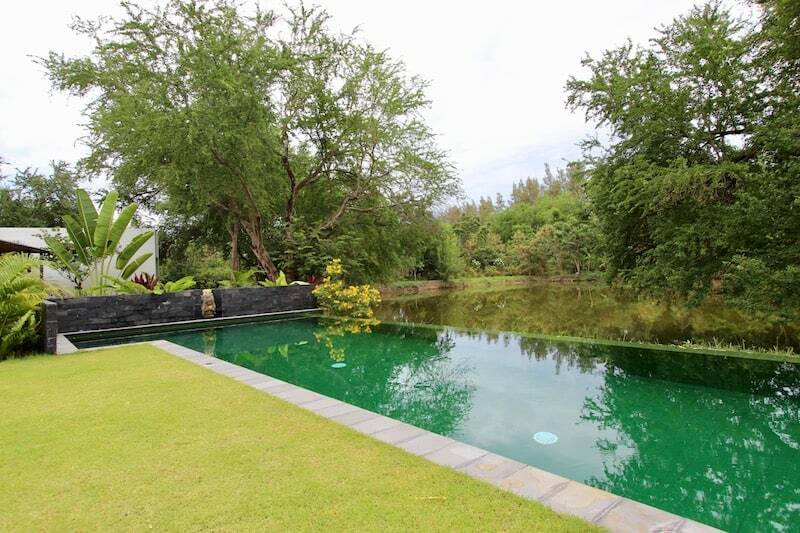 To the right of the terrace and intentionally placed so as not to mar the lake view, is the 15 x 5 meter long salt water swimming pool. 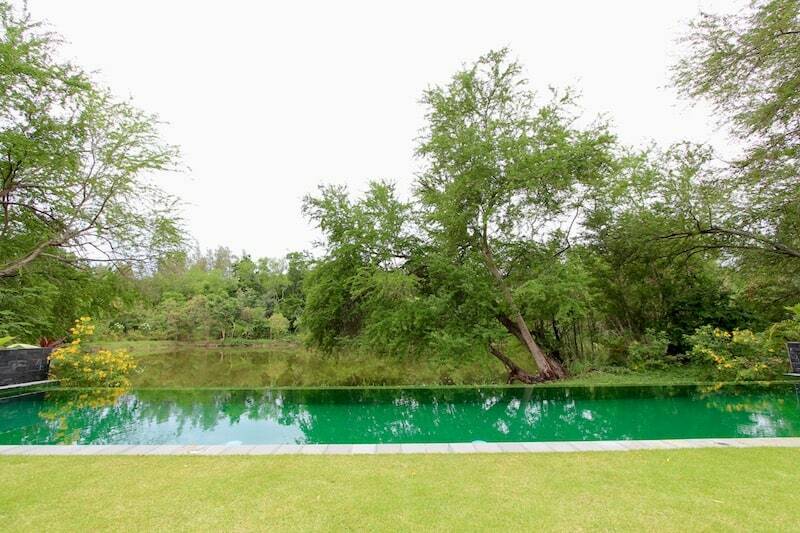 The pool is surrounded by lush gardens and the lake, which gives the impression of the infinity edge overflowing into the body of water. 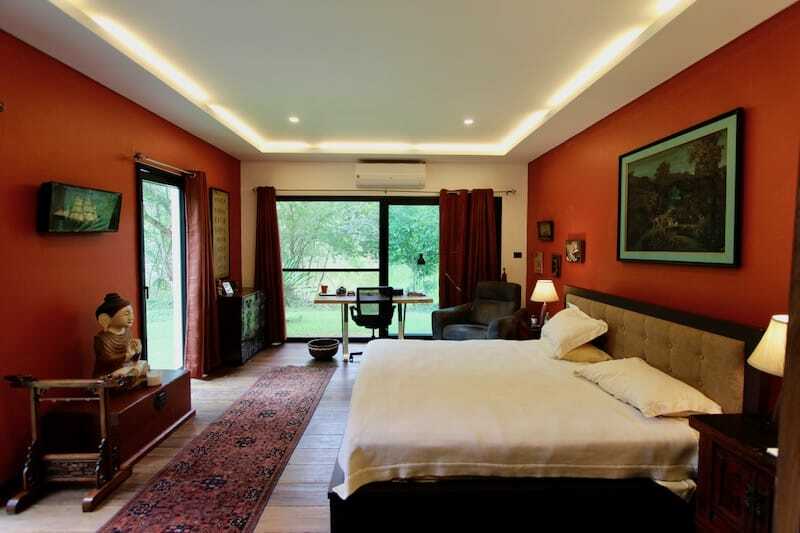 The master suite is luxurious and spacious with sliding glass doors on 2 walls to bring nature closer. 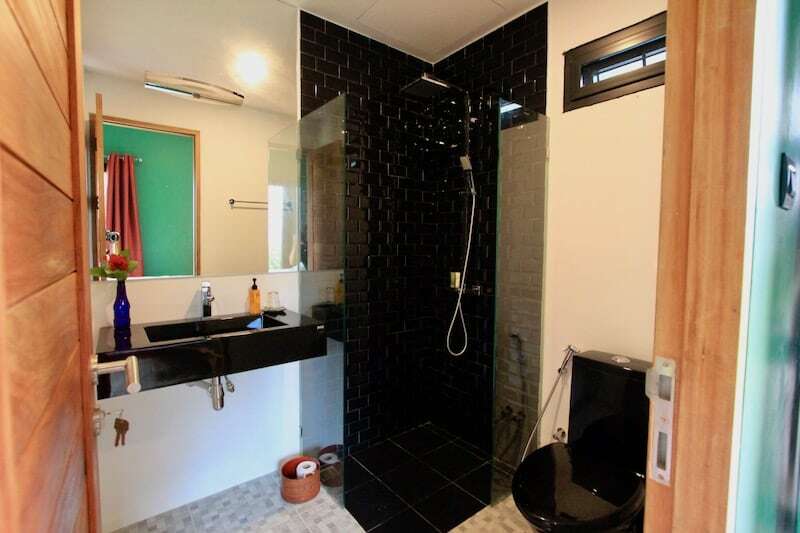 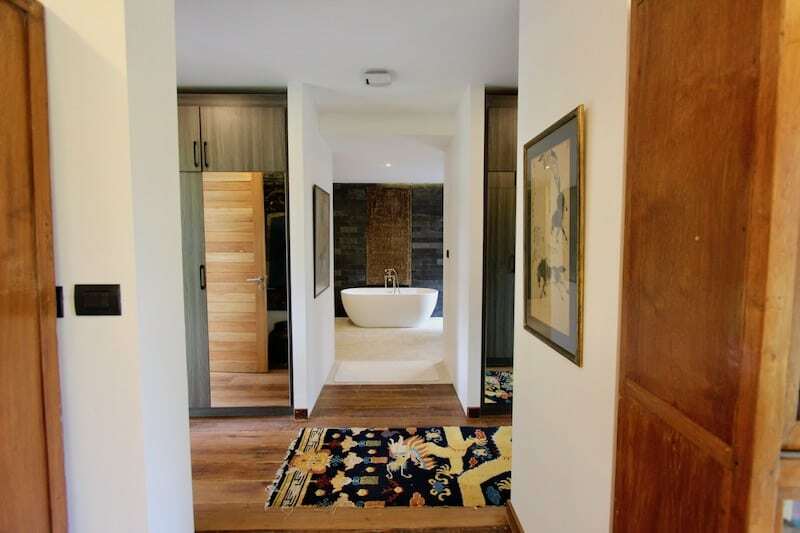 There is a large his and hers walk-in wardrobe which separates the bedroom and the huge bathroom. 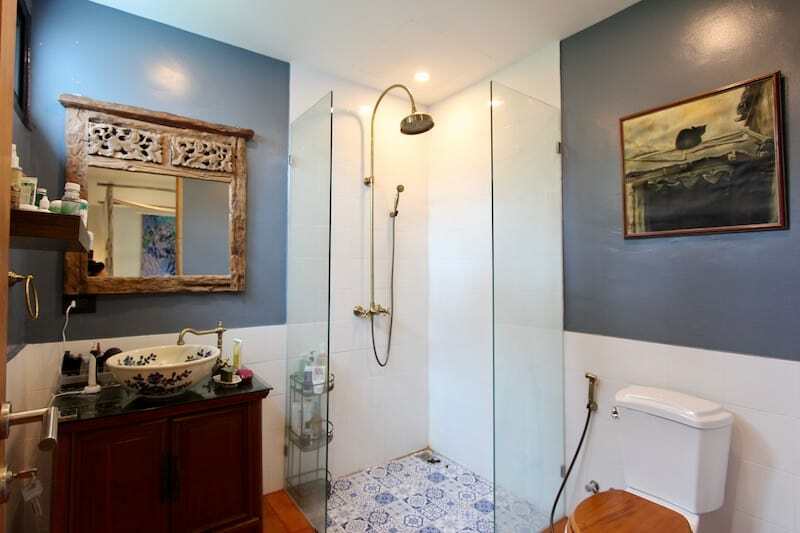 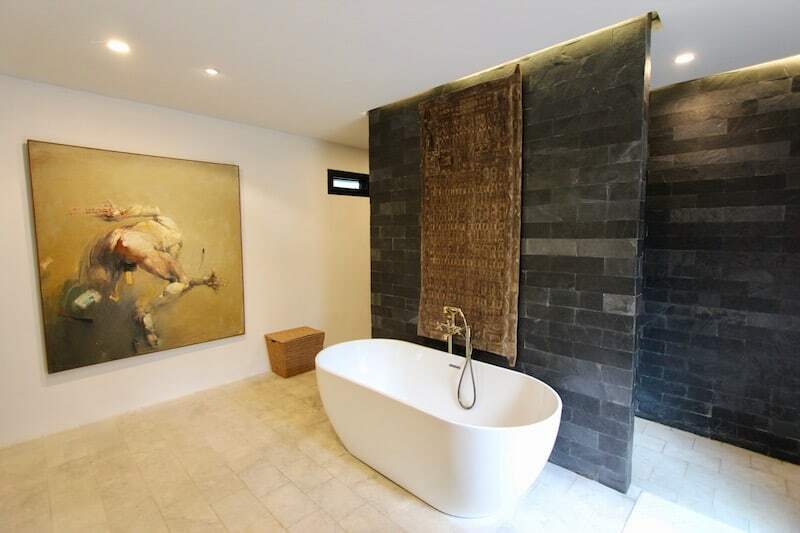 A gorgeous stand-alone bathtub with bronze fittings is the centerpiece, and the walk-in shower and toilet areas are hidden behind slate walls for privacy. 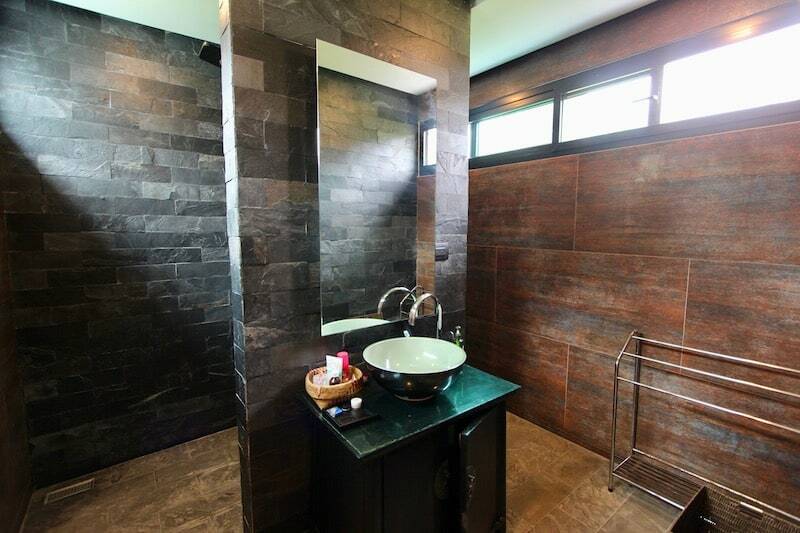 There are 2 vanities framed with slate, each with a sink and mirror. 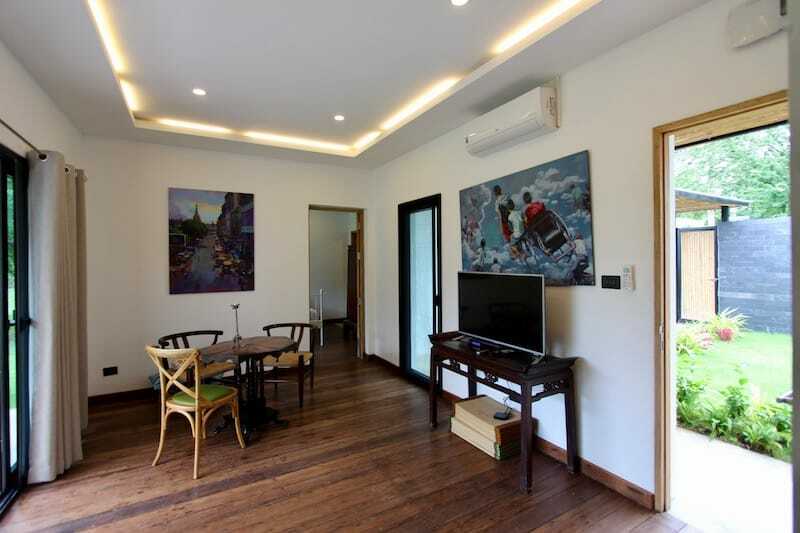 The two guest suites each enjoy a private living room (1 guest suite also has a small, fully equipped kitchen), 2 bedrooms and 2 en-suite bathrooms. 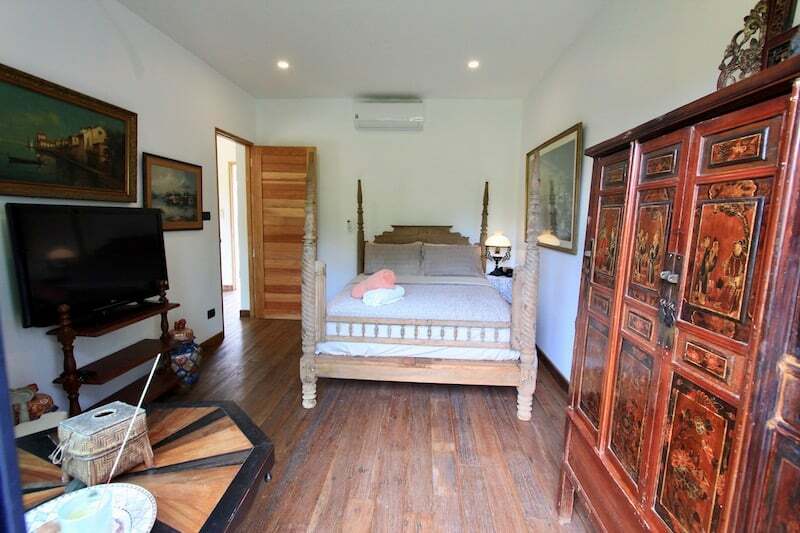 Each guest suite is a short walk from the main house via a garden path, and they are completely private yet also still feel like a part of the main house. 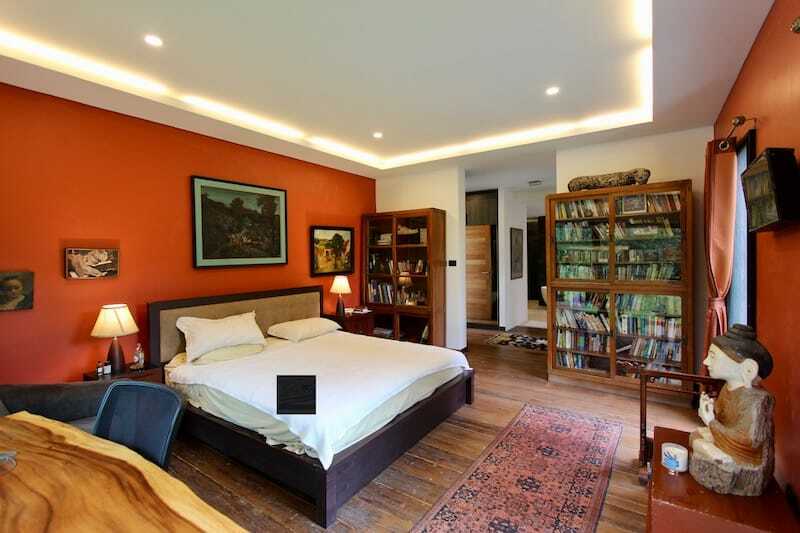 The living room, kitchen and all the bedrooms throughout have beautiful hardwood floors. 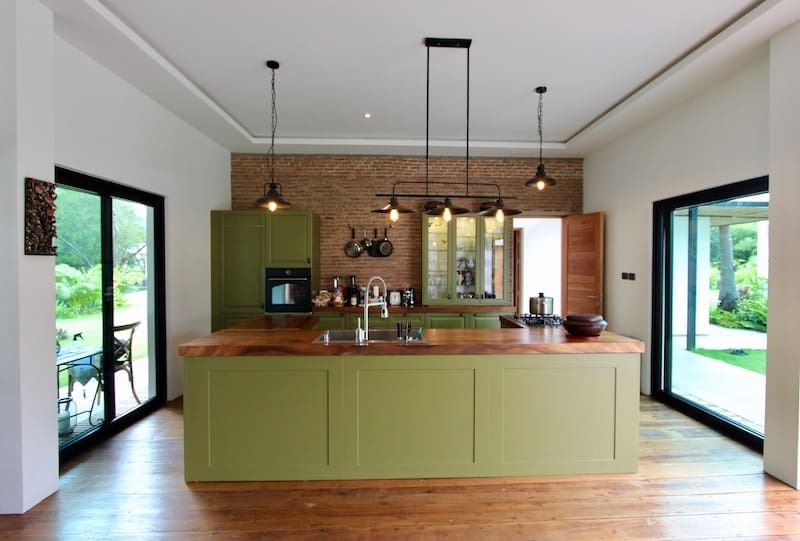 The kitchen is from Cabinet, one of the best kitchen manufacturers in Hua Hin. 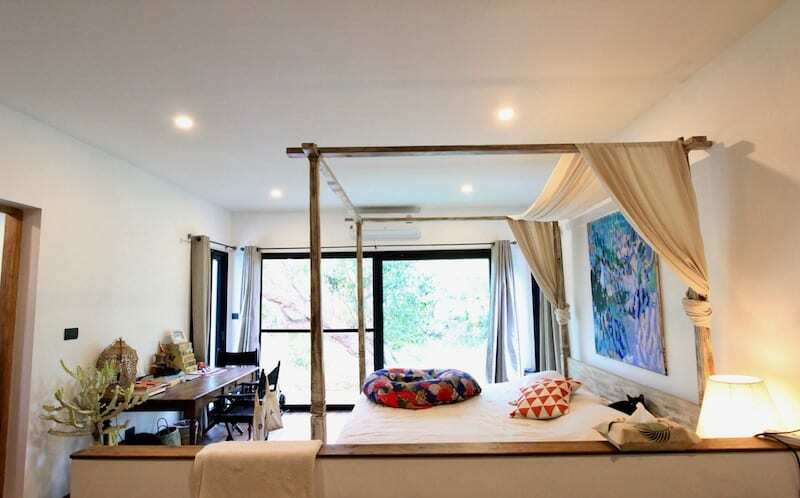 The property has solar panels, AC units and fly screens throughout. 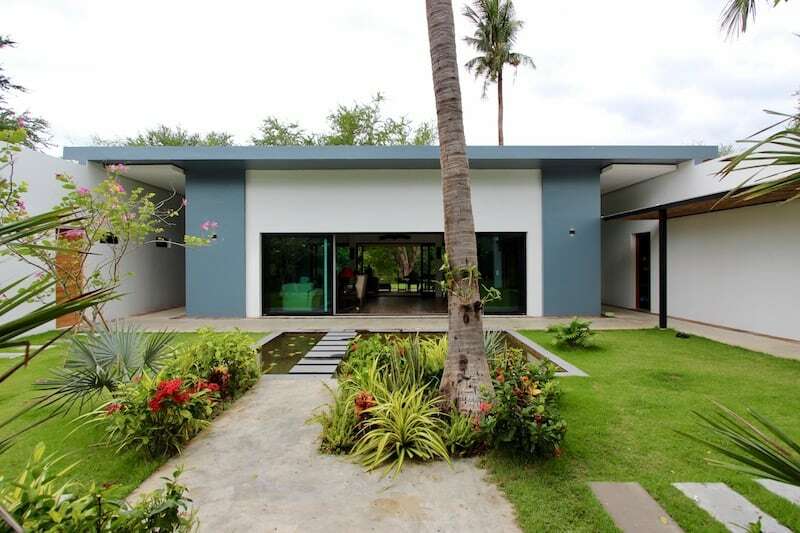 It also includes a large pantry/storage and laundry room with concealed area for drying clothes, a covered carport for 2 cars plus a large driveway to accommodate more vehicles. 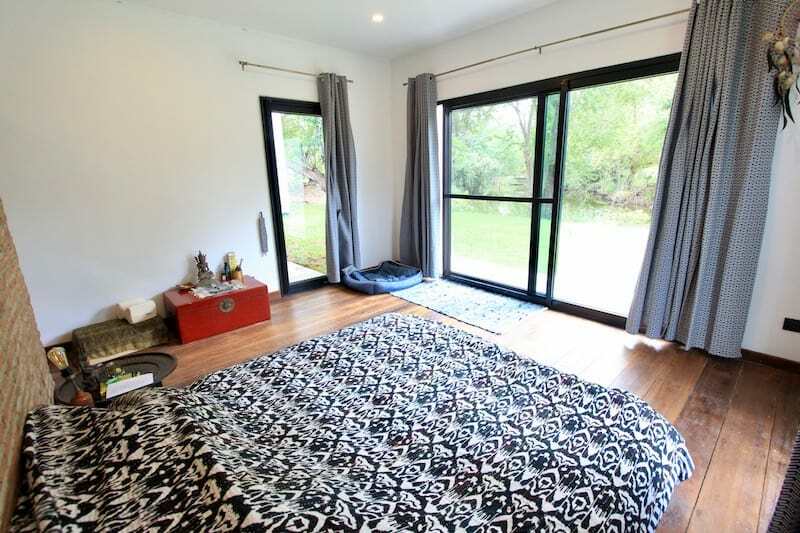 There is a very large warehouse/storage container on the property, perfect for someone with a creative streak or hobbies. 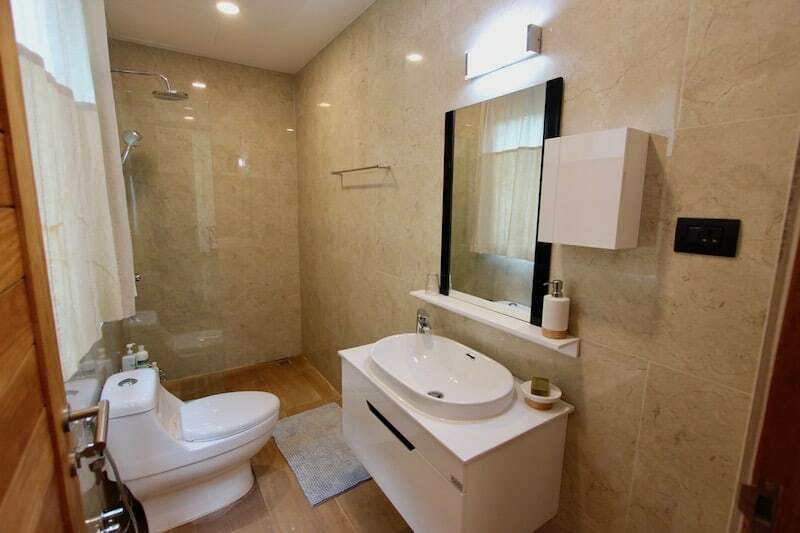 The home is sold fully furnished with beautiful, high quality furnishings, and is absolutely turn-key with everything in top condition.